This author chose to remain anonymous. Can you think of the most negative person that you know? Most likely you can, and the emotions that you’ll experience as you think of them are not pretty. The relationships that we have with negative people are often complicated and tense. The closer they are in our lives the more difficult our lives become as our desire to be free from negativity becomes entangled with our desire to be close to the one’s that we love. In my case, the most negative person in my life was my mom. I still remember the day like it was yesterday. I was 17-years-old, excitedly hitting the load, and reload button on my laptop. I was too impatient to wait until morning, and so I stayed up late in anticipation for my final grades of my final semester of high school. Eventually, my grades loaded, and I excitedly read over the marks in each of my classes. Almost all my marks were A’s, except for Chemistry, which was a C+. Knowing that this grade didn’t affect my college application eased my feelings towards these particular results, and so I eagerly ran to tell to my Mom the good news. I showed her my marks, letting her know how happy I was to receive mostly A’s for all of my hard work and effort. She sat, silent, barely nodding at me as she read her book. “Mom, Mom, I got all A’s. Well, except for one C+, but that doesn’t count,” I explained hurriedly. Immediately my Mom’s head shot up from her book. “You got a C+? Well that isn’t very good,” were her first words of our conversation. All my pride and excitement was instantly deflated. I had failed to make my mother proud, once again. Her simple comment uttered without a second thought created a thick veil of shame around me, one I had been familiar with my entire childhood. If you are on this site it’s probably because you want to embrace positivity for yourself and for your family. But, if you’ve experienced negativity in your past, no matter how big or small, you will need to make peace with it before you can move forward on your journey of positive parenting. It is possible to find healing from the many wounds experienced by adult children who have complicated relationships with their parents. One of the many benefits of journeying through the pain of your past is that you can finally take control of your future. You can become a parent that effectively disciplines, uses your words in a powerfully positive way for your children, while teaching your children about the importance of building character in their lives. Positive parenting – sometimes called positive discipline, gentle guidance or loving guidance – is simply guidance that keeps our child on the right path, offered in a positive way that resists any temptation to be punitive. Studies show that’s what helps kids learn consideration and responsibility, and makes for happier kids and parents. Positive parenting teaches our children through respect and compassion that they are valued, regardless of their actions. Positive parenting does not shame, blame, punish, or criticize. Positive parenting does not expect of us perfection, but rather a teachable spirit, for both parent and child. Positive discipline guides children towards the right behavior, not through punishment, but by taking the disobedient behavior as a teachable moment. If you’re like me you might be reading this with stars in your eyes. Positive parenting deserves a place amongst furry pink rabbits and sparkly unicorns. This can’t be real life, can it? If all you know of parenting is criticism, shame and fear, then moving past those experiences into positive parenting can feel impossible. That has definitely been true in my case. Ever since I found out about positive parenting, I just can’t leave the idea behind. I just can’t go back to parenting in the same critical, punitive way that I was raised. It can seem quite challenging to make peace with your past and move on to being a positive parent. But it can be done. 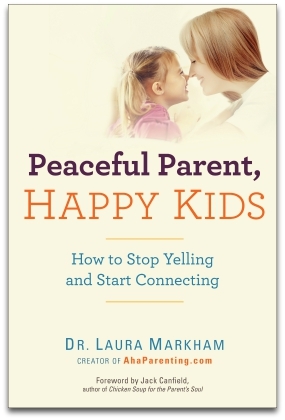 Bonus: Free mini-course How to Be a Positive Parent. Click here.